1. Preheat the oven to 200°C, gas mark 6. Toss the carrots with 1 tbsp oil and tip onto a baking tray. Season, then roast for 10 minutes. Meanwhile, mix the garlic and rosemary with 1 tbsp oil in a bowl. Add the chicken; season and combine well. 2. Nestle the chicken breasts, skin-side up, among the carrots. Return to the oven for 10 minutes, then splash over the balsamic vinegar and orange juice. Roast for another 10 minutes until the chicken is cooked and the carrots are sticky and tender. 3. For the cabbage, heat the remaining oil in a large pan over a high heat. Fry the caraway seeds for 1 minute, then add the cabbage and 100ml water. Cover and cook for 3-5 minutes, stirring occasionally, until just tender. 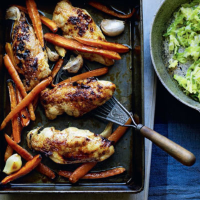 Season and serve the cabbage with the chicken, carrots and syrupy juices.